hudsonlyricopera.org - HLO Goes to Broadway! 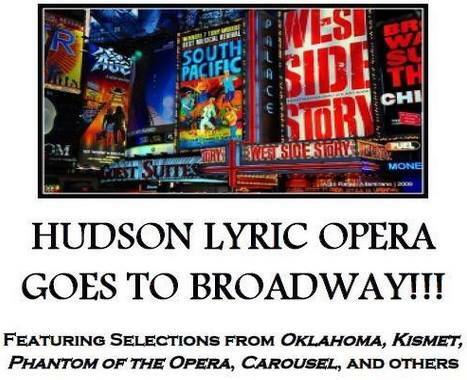 Come to a concert with Hudson Lyric Opera and enjoy selections from famous Broadway shows. These concerts are fundraisers to support the production of our Fall 2015 Opera. We look forward to seeing you! Sat. May 16, 2015 @ 7pm at Graymoor Spiritual Life Center (Franciscan Friars of the Atonement) The center is located at 1320 Route 9 in Garrison, NY, five miles north of Peekskill, NY, and 13 miles south of I-84. Call 845-709-2273, or send email to info@hudsonlyricopera.org. Click here to be on our HLO Email List.